For over four years, Robert Stuart has been forensically investigating the innumerable inconsistencies, contradictions, anomalies and apparent falsehoods in the BBC Panorama documentary Saving Syria's Children. Speaking exclusively to Sputnik, the former journalist shares his most troubling discoveries. On the evening of August 29 2013, just as the UK parliament was quite literally voting on possible military intervention in Syria, BBC News at Ten broadcast a report by journalist Ian Pannell and cameraman Darren Conway from Syria, which claimed a Syrian fighter jet had dropped an incendiary bomb containing a "napalm-type" substance — possibly thermite — on the playground of an Aleppo school. After its broadcast, some viewers took to the internet to express concerns about the veracity of the report's footage. Among them was Robert Stuart, a former journalist working for a small community organization in Islington, London. One scene in particular struck him as "extremely odd." In it, males young and old, their skin apparently in tatters, race into a "basic hospital funded by handouts" to be treated for chemical burns. At one particularly disturbing point, a number writhe, drool and groan, apparently in great distress. However, the men are initially "quiet and static," before the central figure looks directly into the camera for several moments and raises his arm, at which point "they start rolling around in agony and wailing. It looks farcical, ridiculous," Robert told Sputnik. A GMC-registered practicing doctor, who'd worked with burns victims firsthand, believed the scene to be "an act." "[They] were able to sit down, be touched by others, even talk. This is not how a severe burn victim would present. Most would be screaming the place down in agony even after treatment and all sorts of pain drugs, but they're able to speak and breathe very well. Some are shown with skin hanging off but the flesh beneath actually looks like more skin. Also, if the poison was dropped from a plane, their hair would've been lost and patches would be evident — many still have full heads," the doctor said. This scene and other questionable aspects of the brief report prompted him to pen a letter to the BBC — as he was writing it, the BBC broadcast a Panorama documentary, Saving Syria's Children, which expanded on the original report, and included further footage. The documentary was said to have been intended to cover the work of two British doctors in Syria — but apparently completely by chance, while they were filming, the chemical attack occurred. Ever since, Robert has repeatedly reviewed the program. As of December 2017, he's identified contradictions, anomalies and areas of concern "almost too numerous to list." At best, he believes the broadcast contains many scenes which are "largely, if not entirely, staged" — at worst, he suggests its content, and even the attack it allegedly covers, may be "fictionalized." ​His correspondence with the UK's state broadcaster about these issues has also continued — their response has been equal parts "stonewalling, evasion and misdirection." Part of this effort, he alleges, includes the "diligent" blocking of every copy of Saving Syria's Children on YouTube — as a result, one won't find a "single scrap" of footage from the documentary on the platform. Anything uploaded is "taken down within hours," which Robert claims isn't the case with "any other" Panorama documentary. Nonetheless, the documentary remains viewable on Vimeo. One key source of confusion concerns the exact point of the attack. According to the BBC it took place August 26, 2013, although accounts of its timing "implausibly" span a range of six hours — Human Rights Watch states it occurred "around midday," while the Violations Documentation Center places it at two in the afternoon. Conversely, Pannell himself stated in BBC Complaints correspondence with Robert the strike occurred "at around 5.30pm," while Conway places it between three and five. Alleged eyewitness Abu Yousef suggests it was closer to six, which is corroborated by a Turkish media article quoting a Syrian doctor who says it occurred at that time — although the chemical weapon was instead said to be a "phosphorus bomb." ​Complicating the picture further, a team of Syrian investigators has researched the attack, contacting a former commander of the Al-Tawhid Brigade based in Aleppo province in August 2013. Despite having every reason to validate the claim, given it would offer useful propaganda against the Syrian government, they instead attested a "napalm bomb" attack did not happen that month, and none of the events depicted in the documentary actually occurred. "We did not meet any air strike with the substance of napalm on Urum al Kubra or on any other region in the North West Aleppo countryside and the cheap fabrication of the BBC undermines the credibility of the Free Syrian Army. We've done a field investigation with the help of the delegate of the Free Syrian Red Crescent and [found] no victims, no traces and no memory with anybody of the alleged air strikes with the substance of Napalm," the commander said. The commander has agreed to provide a full statement to the BBC and offered to provide BBC journalists with safe transit from Antakya, Turkey to Urm Al-Kubra to interview witnesses and conduct their own investigation. A July 2014 telephone conversation between two members of said Syrian investigative team documents the account of a local resident, who similarly affirms the alleged napalm bomb attack did not occur. "He told me, ‘we didn't hear about such a thing…we hear about rockets, there is a lot.' When I told him it burns, he told me ‘we never had something like that, never, never. Nor did we ever hear about it.' I asked him whether he was maybe out of the region at the specific time, and he said ‘even if I would have left the people keep on talking about this thing, I would have known about it'," the investigator said. Almost every repeat viewing of Saving Syria's Children raises further concerns and questions for Robert. A relatively recent discovery was reporter Pannell and cameraman Conway's apparent embedment with jihadi group Ahrar al-Sham. Approximately 10 minutes into the documentary, in a scene said to be shot August 25, Dr. Hallam sets off to "see what medical care is available for children closer to where the fighting is" — and Pannell follows. "Western journalists have been targeted in Syria, so I have to travel with my own security. The doctors are able to be more low key and take their own vehicles," he explains. A number of vehicles are then shown setting off in convoy — among them a white pickup truck which, dashcam level footage reveals, bears the Ahrar al Sham emblem on its bonnet. Ahrar al Sham has been accused of being involved in, or leading, numerous atrocities over the course of the Syrian crisis — a mere three weeks prior to Pannell's trip, Human Rights Watch alleges the group were, alongside Daesh and al-Qaeda affiliate Jabhat al-Nusra, "key fundraisers, organizers, planners, and executors" of an attack in which at least 190 killed and over 200 — "the vast majority women and children" — were kidnapped. As the program enters its eleventh minute, Pannell's van approaches a checkpoint held by a separate rebel faction, an experience common across the country at the time. After a brief and seemingly superficial inspection, the convoy is allowed to pass through unmolested. As Pannell himself narrates, the faction in question is "ISIS…the Islamic State of Iraq and Syria." At the time, the group was not subject to the extreme global notoriety it endures today — Robert suggests such a scene "simply wouldn't be plausible now." "Conway is seemingly able to hop between vehicles with impunity at the checkpoint. As they reach it, Pannell instructs the cameraman — presumably Conway, the sole shooter credited on the documentary — to ‘put the camera down a bit'. Seconds later, in footage filmed from the rear of another vehicle, a Daesh guard inspects vehicles. How did they not end up in orange jumpsuits having their heads chopped off?" Robert told Sputnik. ​Daesh also crops up elsewhere in the documentary — in a scene filmed at close quarters by Conway, an ambulance bearing the group's distinctive flag transports victims of the apparent attack to hospital, a "marked contrast" from the "ostensibly tense" checkpoint scene. A recurring character throughout Saving Syria's Children is Dr. Rola Hallam, a British doctor representing the charity Hand in Hand for Syria. She immediately jumped out to Robert due to the manner of her introduction — taking time out during the apparent mass casualty scenario to conduct a calm and coherent to-camera interview. ​Dr. Hallam also appeared on the BBC prior to the Panorama broadcast — interviewed on Newsnight August 30 2013, the day after parliament voted against military action, she expressed disappointment at the result, suggesting the world had "failed the Syrian nation." Subsequent digging into the doctor's background offered yet further indications she and the organization she represents harbor strongly interventionist stances. For instance, her father is Dr. Mousa al-Kurdi — who, according to a February 2013 article written Dr. Hallam's colleague Dr. Saleyha Ahsan, is "involved politically" with the controversial Syrian National Council. Dr. Hallam has denied that allegation — nonetheless, in a 2012 Al Jazeera interview, he passionately advocated for the Syrian National Council's recognition as the "sole representative" of all Syrians. He also boasted of how at that year's Friends of Syria summit in Istanbul — attended by Hillary Clinton — he told the foreign ministers of several governments, including Victoria Nuland of the US State Department, "either you defend us or you arm the Free Syrian Army to defend us — you have the choice." 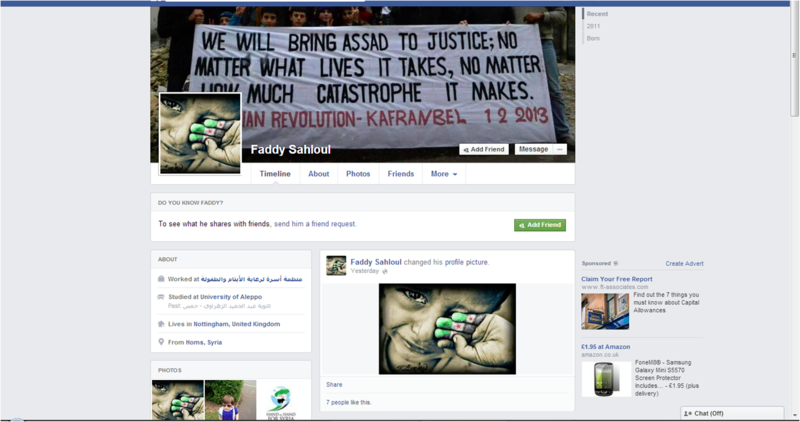 Facebook banner of Faddy Sahloul, cofounder of Hand in Hand for Syria. Robert's exploration into Hand in Hand for Syria also raised many serious anxieties. The UK Charity Commission states the organization exists for "the advancement of health or saving lives" — yet, he found until July 2014, the Facebook banner of cofounder Faddy Sahloul read "WE WILL BRING ASSAD TO JUSTICE; NO MATTER WHAT LIVES IT TAKES, NO MATTER HOW MUCH CATASTROPHE IT MAKES." Moreover, he uncovered a photo of a Hand in Hand for Syria nurse, who also appears in the documentary, tending to the injuries of a child soldier. Unidentified Hand in Hand for Syria worker with child soldier. "In September 2015, I formally raised my concerns with the Charity Commission, which ruled the cofounder's bloodthirsty Facebook banner was a ‘historical issue' that had since been addressed by the charity's trustees, and the image of the nurse treating a child fighter was not ‘sufficient' evidence Hand in Hand for Syria was ‘celebrating or supporting violence'," Robert told Sputnik. 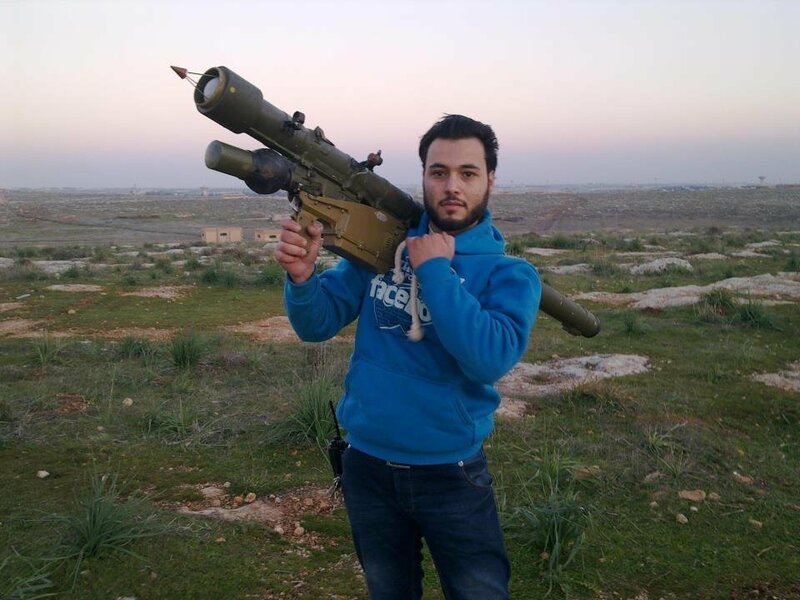 Iessa Obied, a medical professional connected with Hand in Hand for Syria, poses with rocket launcher. His battles with the Charity Commission did not end there — in March 2016, he submitted a further complaint, after uncovering images of Iessa Obied, a medical professional connected with Hand in Hand for Syria, posing with a "shocking" array of armaments, including rocket launchers, sniper rifles, "hell cannon" mortars, tanks, and more. 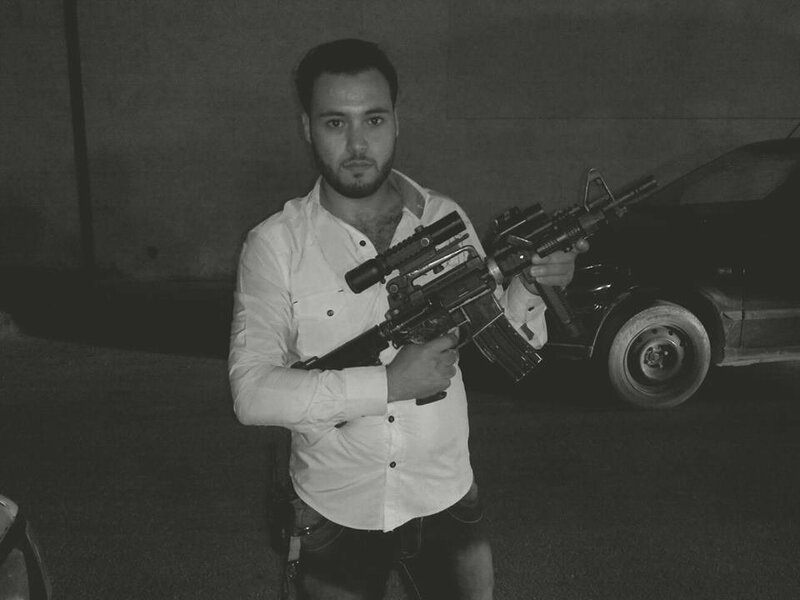 Iessa Obied, a medical professional connected with Hand in Hand for Syria, poses with a rifle. However, for the Commission, the images "[did] not raise sufficient regulatory concern." Despite official denials, Robert intends to continue his campaign until the truth has finally been revealed — his determination stems from a belief the alleged falsification was "absolutely historic, and unbelievably brazen." "It was clearly very carefully orchestrated and set up. I had few illusions about the corporate media and the BBC, the one remaining perhaps being they wouldn't fake something outright. This is an absolutely historic case, and unique. Whatever criticisms you could level at state-owned media in Iran or North Korea, nobody has ever done this before," he rails. In March 2017, Robert's efforts attracted the attention of leading TV and radio producer Victor Lewis-Smith. He raised troubling questions with the BBC about Saving Syria's Children, threatening to literally tear up a contract for a forthcoming radio comedy pilot with the corporation unless top brass could offer satisfactory answers. In response, the BBC alleged Ofcom had reviewed the program and confirmed the authenticity of the documentary. However, the organization's ruling related to a news report by television channel RT, which featured Robert's investigation. The BBC complained to OfCom "the program presented information in an inaccurate and misleading way." While Ofcom upheld the complaint, it acknowledged it did not "undertake an assessment of the accuracy and/or impartiality of the program" in reaching its decision. Robert states this was "in no way a clean bill of health" for the documentary. "It was not possible or appropriate for Ofcom to attempt to prove or disprove the allegations made about the BBC in the program. Similarly, Ofcom had no statutory jurisdiction to assess the accuracy and impartiality of the BBC program. Rather, our concern in this case was solely whether [it] resulted in unfairness to the BBC," the regulator wrote. ​Lewis-Smith didn't accept their defense, again threatening to terminate his contract, and demanding Panorama release raw footage of the event in order to gauge its veracity. The eventual statement issued by the BBC did nothing to address his concerns, so he shredded his contract. ​He now intends to make a crowdfunded documentary investigating the program, with Robert's assistance. Sputnik submitted requests for comment from the BBC, but as of December 30 2017 has received no response. "If the extent to which the BBC manufactured this documentary was proven, it would be a watershed moment. There'd be no coming back from that. It would destroy their credibility globally. Pannell and Conway could go down in history as having destroyed the BBC," Robert concludes. The views and opinions expressed by Robert Stuart are those of the speaker and do not necessarily reflect those of Sputnik.